1. Slightly crush the whole spices in a mortar and pestle. 2. Heat 2 tbsp coconut oil in a pressure cooker. Add whole spices and saute until fragrant. Then add sliced onion, ginger, garlic, green chilies, curry leaves, potato cubes and salt. Saute until onion turns transparent. Add turmeric powder, chilly powder, coriander powder and garam masala powder. Saute for a minute and then add the mutton pieces, 3/4 cup hot water and enough salt. Mix well. Bring to a boil and cover with the pressure cooker lid. Pressure cook for 3 – 4 whistles depending on the toughness or tenderness of the meat. Switch off. Open after 10 minutes. Check for salt. Sprinkle 1/4 tsp pepper powder and a pinch of garam masala powder. Add 1 cup thick coconut milk, few curry leaves and cook for one minute at low heat. Switch off. 3. In a small pan, heat 1 tsp coconut oil. Splutter mustard seeds and fry dry red chilies and curry leaves. Add thinly sliced pearl onion, if using and fry until browned. Pour over the prepared curry. Set aside for 10 minutes. This curry tends to get thick over time. Its one of my favorite mutton recipes..do give this a try! 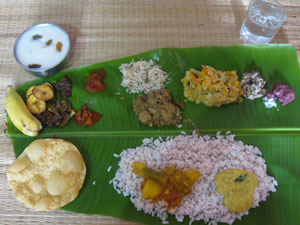 Serve with appam, kallappam, idiyappam, porotta or chapathis. 1. The recipe of this curry is similar to that of mutton stew but it tastes different because I added turmeric powder, coriander powder, mustard seasoning etc. You can follow the same recipe for making mutton stew but avoid adding turmeric powder, coriander powder, chilly powder and seasoning with mustard seeds (step 3). Instead of seasoning, add a tsp of coconut oil once the curry is done. 2. Also cut the potato into large cubes and saute them along with the onion, green chilies etc in coconut oil. This will improve their taste and will prevent them from getting mashed up in the curry. In case the mutton cubes don’t get cooked after 4 whistles, remove the potato cubes to a plate and then pressure-cook for 1 – 2 whistles until the mutton cubes get done. Open the cooker, add the potato cubes, coconut milk and then proceed with the recipe.